MUFF WIGGLER :: View topic - Rene and Power Supplies - right and wrong! Rene and Power Supplies - right and wrong! So, warning to y'all - don't buy the Meanwell power supply if you want to have a Rene' in your rack. Buy the Volgen above. works with the Rene and the Meanwell does not. modules, but NOT with a RENE! The René module is not compatible with power solutions using the MeanWell brand AC Adapters. The René module will not work on power solution using the MeanWell brand AC Adapters. Make Noise will not be able to provide support for René modules used on power solutions using the MeanWell brand AC Adapters. Anyway... yeah. Don't buy a Meanwell power brick for any rack with a Rene. I just wonder if I buy a new 7u intellijel case, will I be able to mount a Rene in it without issue...aren't they still using Meanwell power bricks? name on it at all, just "Model ST-C-090-19500474CT"
Oh well.... Meta-moral of the story: Buy the Volgen KTPS65-1543DT-3P-VI-C-P1 from DigiKey and stop messing around. bc3 solution and report back how it works with Rene. I believe that it was user Graham Hinton that first shed the light on the actually issue at play here. It's due to the way that the MeanWell adapaters are grounded. They ground themselves to the metal casing of the adapter, called a floating ground. This is the cheap way to ground something, but there's nothing wrong with it (that I can recall). However, the Make Noise touch modules need a true, fixed ground source to register when the resistance of the circuit has changed (caused by the press of the finger against the touch pads). If the ground is inaccurate, the registering of touches will be inaccurate. This is where the Volgen adapter comes in to play: it has a ground prong and is grounded to the Earth main, which will be a constant ground. that is my understanding at least, by no means am I anything close to an electrician, but I found the explanation interesting. to be sure, check your data sheets. Had this exact issue with Rene, Pressure Points and Meanwell ungrounded adapters. Also tingling sensation on the faceplates of modules as well as a few instances of unexpected behaviors from other modules. Grounding myself by touching a screw on the case provided temporary relief. As noted above, Graham Hinton and a few others shed additional light and helped sort things out. Switching to grounded Volgen resolved all issues permanently. Right? Good to know, as I'm now having second thoughts about buying one. Edit: Or am I reading this in reverse? Myth: Some adapters (Meanwell, among others) don't work well with a Rene because they don't pass ground and the Volgen adapters do. ground pin to the barrel of the DC-out plug, pretty much the same as the Kaga Volgen. Also, grounding the system via the Tek 475 ground shield doesn't help either. some form of interference happening that isn't just a floating ground. DISCLAIMER: I'm not an EE, this solution worked for me, ymmv! I have two MeanWell GS90A15-P1M adapters purchased with my Synthrotek deluxe power modules. I removed all other modules from the case, the "jumping" problem still occurred. I switched Deluxe Power modules using same MeanWell adapter, the problem did not go away. 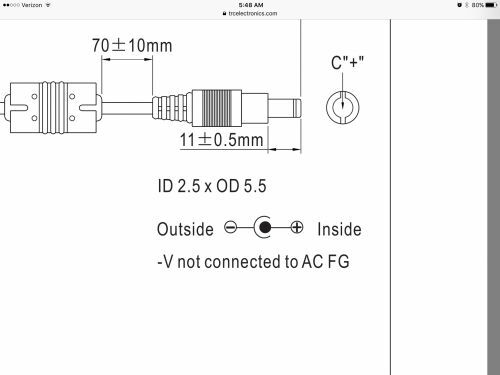 I switched MeanWell adapters, and the problem still happened. Finally I modded one of the adapters as described by @WMDDevices, and the problem went away. Pressure Points works perfectly. Plugged the unmodified adapter back in, and the problem comes back. Same results, regardless of which deluxe power module I use. I've been playing on the modded power supply now for ~6 months now, and it hasn't exhibited anything but expected performance. I wonder what this same test would show for an actual Mean Well adapter. Many people have confirmed (like above) that William Mathewson's DIY fix for the Mean Well does work, so maybe your knockoff adapter has a unique problem? "** Input ground and secondary ground are not connected"
Can anyone comment on this strangely anonymous "Universal AC Adapter" being sold by 4ms and now Synthrotek? Sorry to drag this thread up again, but I'm having the same issue with a custom case with intellijel 30Max power installed, and using the meanwell power brick. Didn't read all manuals and information properly, never crossed my mind it could give me any trouble. I usually find intellijel stuff to be super dependable and well thought through. My question is whether I can use just about any other universal adapter with the right specs other than the meanwell? Or do I have to look for something specific? Any experiences other than with the mentioned Volgen adapter? So the issue with rene is the adapters or the power supplies? Because i had to sell mine which didn't play along with tiptop's zeus with the standard adapter it comes with.. I have Rene being delivered at the moment and my only PSU is a uZeus. What is going to be needed to power the Rene? I will now muddy these waters a little further: with Pressure Points, Rene, and presumably, other touch plate modules, it’s not a binary works/doesn’t work situation. There’s a spectrum of “kind of works” in the middle. For example, I’ve experience using both Pressure Points and Rene in infamous Pittsburgh Modular Move cases using both Meanwell and Volgen bricks, and also the entirely new power supplies built into the Structure cases. These modules were quite dysfunctional in the Move case using a Meanwell brick. Swapping out the Meanwell for a Volgen, these modules functioned, but something was never quite right about their responsiveness: they didn’t always trigger when expected and “pressure” response of the Pressure Points seemed awfully narrow, no matter how you adjusted the trim. Moving these modules into the new Structure case was a revelation—for the first time, I understood how they were supposed to work. Much happier now. So I tried a different adapter. At first, it seemed to improve the situation much. But after a minute or so, the issues are as bad as they were with the meanwell. When I ordered my Intellijel 7U around the middle of last month, their customer service emailed me informing me that they started shipping NEW power supplies with the 7U that, and I quote "Evidently it provides a clear power solution.". Obviously my choice was to wait for them to ship the case until I got the new power supply. I don't have a Rene personally, but I know a fellow on IG who was having issues with his Rene in the Intellijel 7U case and once he changed the power brick he was good to go. Ultimately, is this the fix for people using the Rene with Mean Well adapters? I'm not sure being new to Eurorack and what not. All I have to go off of is comparing the 7U to my Structure 208 from PGH, and they both were quiet as a church mouse when powered on.